Fill-in issues were a staple of comics for many decades, although the practice is not as prevalent today. To ensure comics shipped on time, editors sometimes had stories or entire issues created and filed away in the event the current team on a book failed to meet a deadline. Sometimes a fill-in issue was created quickly. These fill-in issues had guest writers and/or artists and did not necessarily align with the continuity of the title. Many times the work was assigned to non-seasoned creators and that, coupled with the rush to produce the pages, resulted in an inferior product. This is not always the case as guest penciller Michael Golden shows with the Riders in the Void story in Star Wars #38, but that is definitely true for Star Wars #64. Writer David Michelinie, penciller Walter Simonson, and inker Tom Palmer are the regular team for most of Star Wars #51 - 66. Later in that run, Simonson also assumes plotting duties and just does layouts while Tom Palmer provides finishing pencil and ink work. 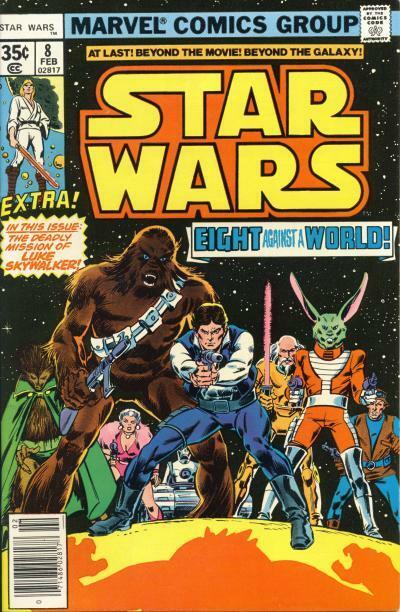 Star Wars #64 is a fill-in issue with pencils provided by artist Joe Brozowski and inks by Vince Colletta. Despite Michelinie's contribution, Star Wars #64 is jarring not only because of the change in art, but in the story itself. 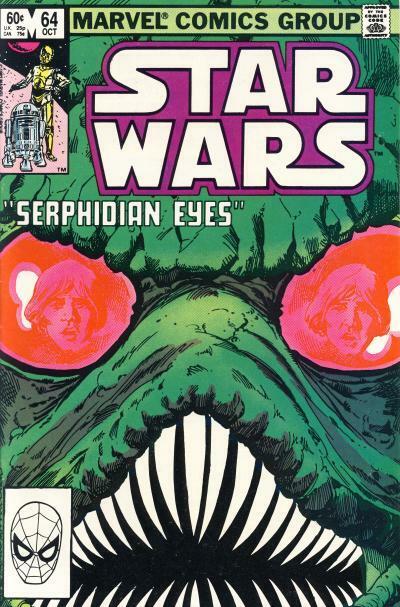 In the tale titled Serphidian Eyes, Luke Skywalker is an active commander in the Rebellion where in the previous story arc Luke was stripped of his rank. 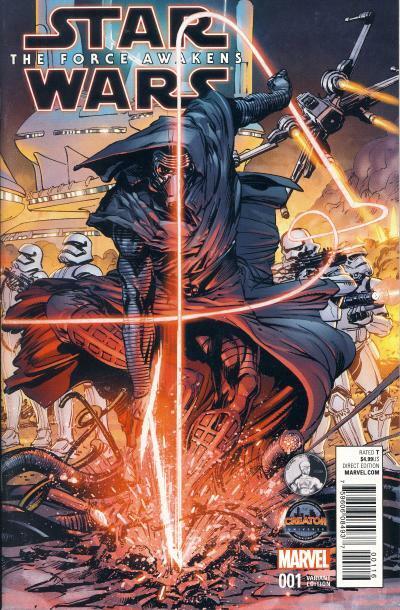 The commission is reinstated in the following issue, Star Wars #65. Luke and two other Rebel pilots are sent to Serphidi by Princess Leia since they need the Serps help in monitoring the Imperial presence in the Belial system. Serps are humanoid reptiles who shunned technology due to their planet's centuries old war. The society has a distinctly medieval bend, complete with a king, knights, squires, princesses, and jesters. The Serps dress the part as well by wearing armor, using lances, and wielding shields that look like they came from Earth. These elements are out of place in a Star Wars story. The crew of the Enterprise can get away with visiting planets with societies from Earth's history because that trope was built into the original television series. To be honest, if it were not for Star Trek's budget constraints, I doubt any planets would have resembled Earth's past. Comics do not have the same budget concerns, which is why a society like the one the Serps have is perplexing. One could immediately think the writer or artist was being lazy; even though this issue was probably completed quickly, anything would have been better than borrowing visuals from a well known Earth time period. At minimum, why not change the look of the armor, lances, and shields? There are a few issues in Marvel's run that repeat this mistake and I cringe as much now as I did when I originally read these stories as a youth. 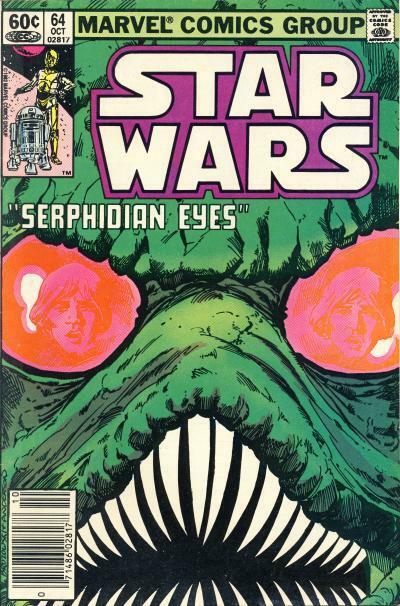 Inside, Serps are red with green eyes, while the cover shows a Serp face that is green with red eyes. To be honest, the interior artwork is not entirely bad; Brozowski draws human figures and the spacecraft from Star Wars very well, no doubt due to having good reference material. A few years later, Brozowski would provide artwork for The Fury of Firestorm/Firestorm, the Nuclear Man and, in 1994, he worked on Xombi for DC's Milestone imprint. The Empire Strikes Back paperback published by Arrow Books contains the original Yoda drawings. Unlike the U.S. version which has the price on the front cover, the price of the paperback is in a square on the bottom back cover. It has prices for the U.K. and Australia. Notice it still says full-color instead of full-colour in the text at the top. 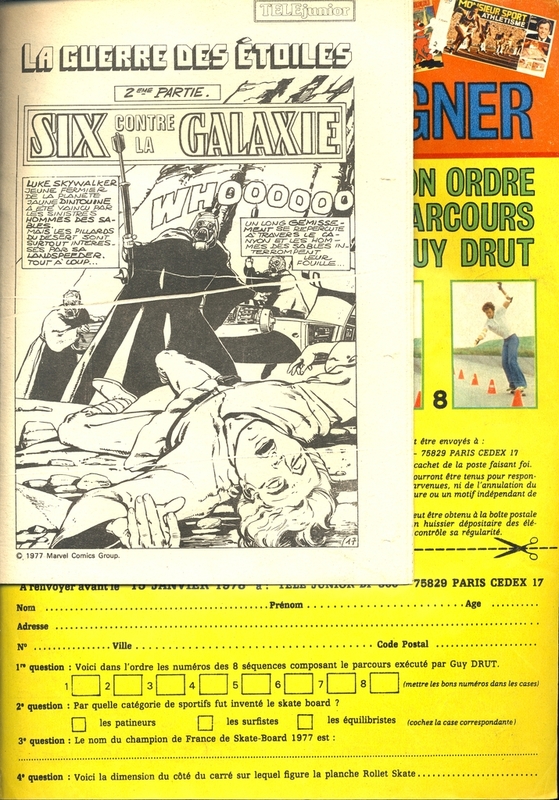 In addition to the pence price, many British Marvel comics are distinguished from their U.S. counterparts by the banner on the top that reads Marvel All-Colour Comics instead of Marvel Comics Group. Interestingly, it also says Not For Sale in Canada in the price box on the back cover. This was an indication to Canadian distributors and bookstores that there is another version of the book available for them to sell. The publisher is clearly shown on the spine. In October 1994 Dark Horse release 3 comics that came polybagged with a Topps trading card. 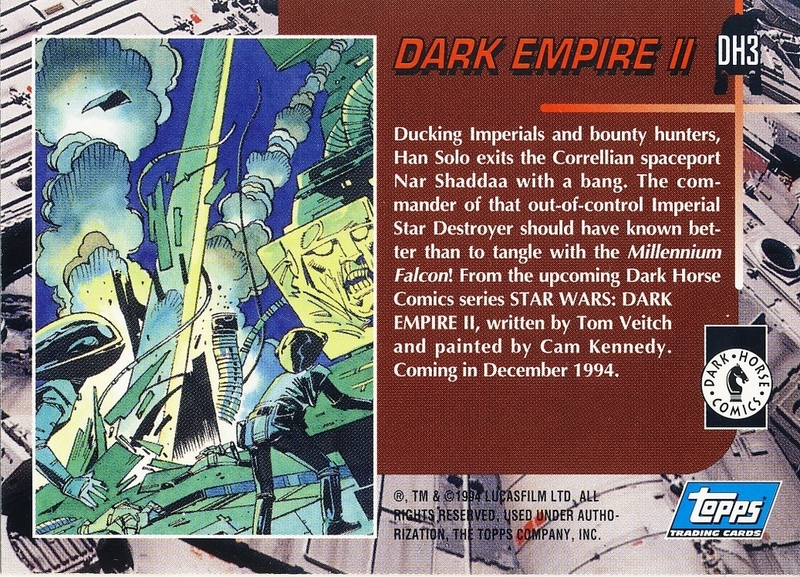 The cards were a cross promotion for Topps' Star Wars Galaxy trading cards and Dark Horse's Dark Empire II mini-series and are labelled DH1 - DH3. The front of each card shows art from the Dark Empire II mini-series and the back has another smaller picture along with text. 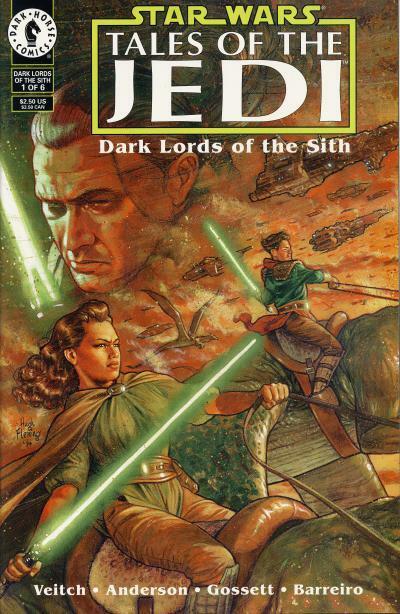 Star Wars: Tales of the Jedi - Dark Lords of the Sith #1 is a 6-issue mini-series that follows the continuing adventures of Nomi Sunrider and Ulic Qel-Droma. 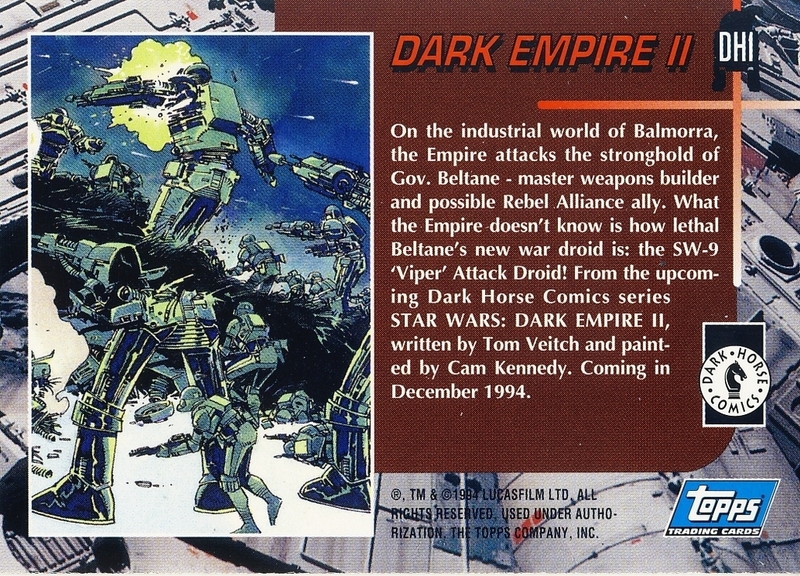 This comic came with the DH1 trading card depicting War Droids. 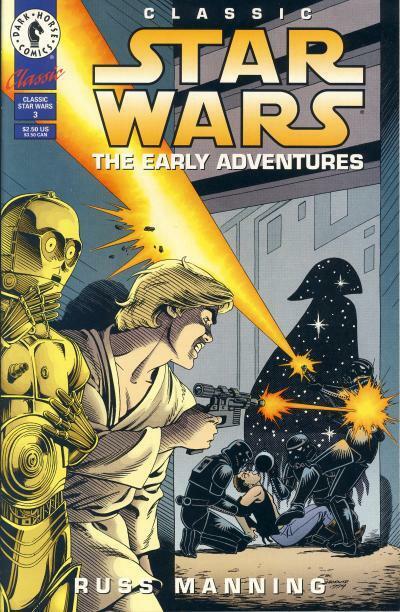 Classic Star Wars: The Early Adventures #3 is the third issue of the series that collects the Russ Manning newspaper strips. 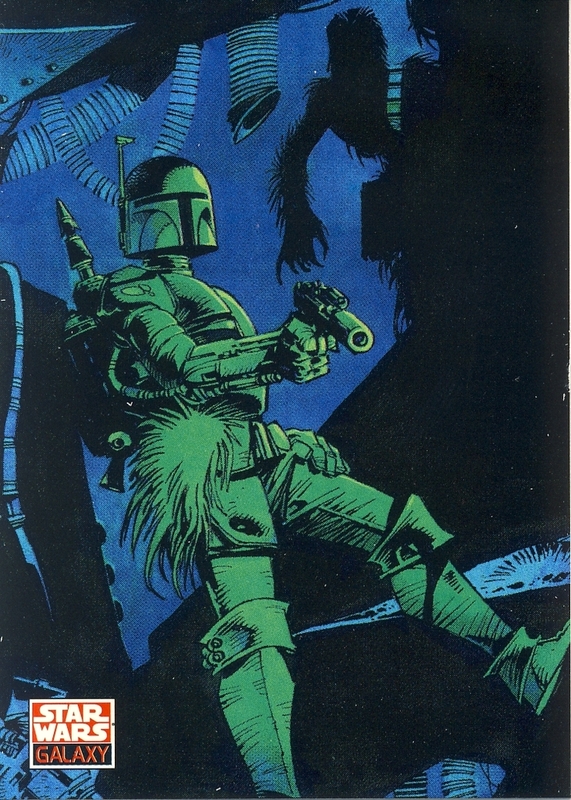 This comic came with the DH2 trading card depicting Boba Fett. Classic Star Wars: Return of the Jedi #1 reprints the first 2 issues of the Marvel adaptation of Return of the Jedi. This comic came with the DH3 trading card depicting the Millennium Falcon. 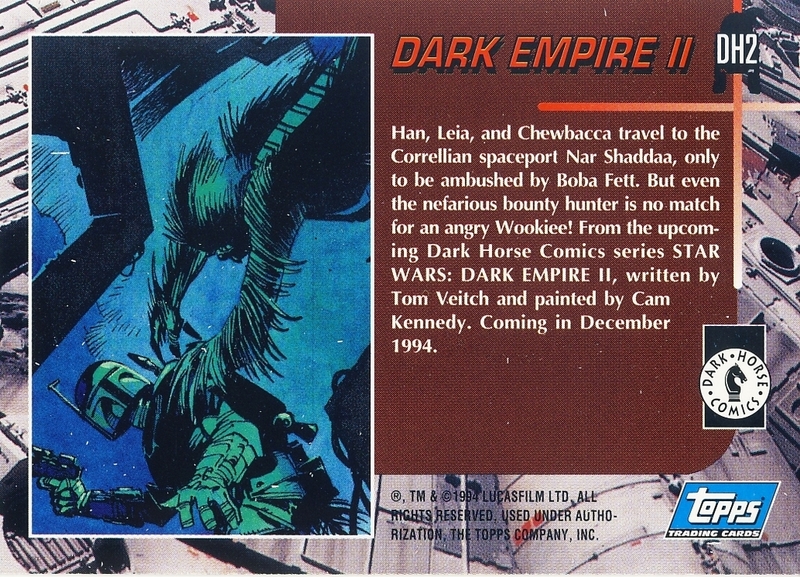 This was not the first time Dark Horse and Topps would cross promote their products. Classic Star Wars #8 and 20 both came polybagged with cards promoting the Star Wars Galaxy trading cards. 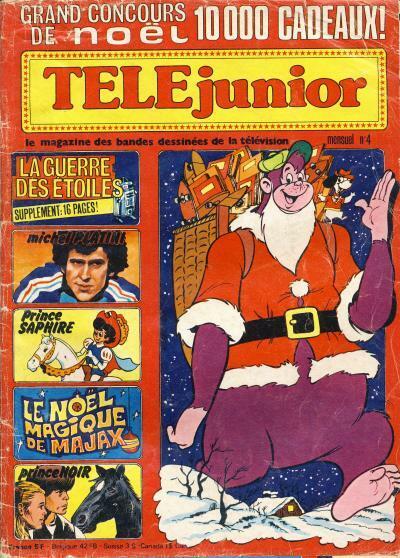 TELEJunior #3 is not the only issue of the French children magazine to contain a Star Wars comic supplement. Stapled to the center of the TELEJunior #4 magazine is a 5 1/2" x 8" 16-page black and white supplement containing Star Wars #2. The covers main panel shows Grape Ape, a Hanna-Barbera character that began airing on Saturday mornings in 1975. The dog on his shoulder is Beegle Beagle and it is no mistake the character was introduced when the King Kong remake was being publicized. Despite only running for 32 episodes, Grape Ape did achieve more fame in Scooby's All-Star Laff-a-Lympics which aired from 1977 through 1980. 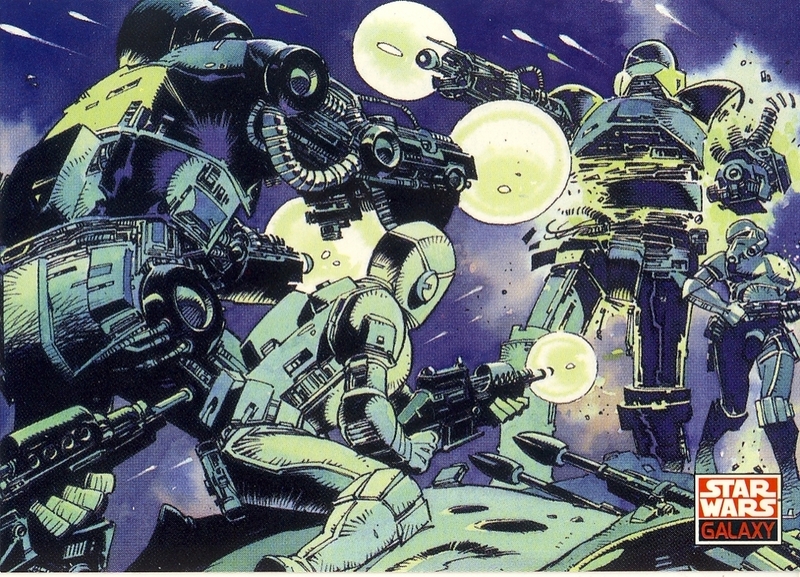 The top panel on the left announces La Guerre des Etoiles Supplement: 16 Pages! There is a crude drawing of R2-D2 accompanying the text. There are more issues with the Star Wars movie adaptation, but the remaining chapters are not included as inserts. When Legacy started in June 2006, there were a few skeptical fans. By the end of Broken, the first story arc, John Ostrander and Jan Duursema had quieted the skeptics and the comic was receiving great reviews. 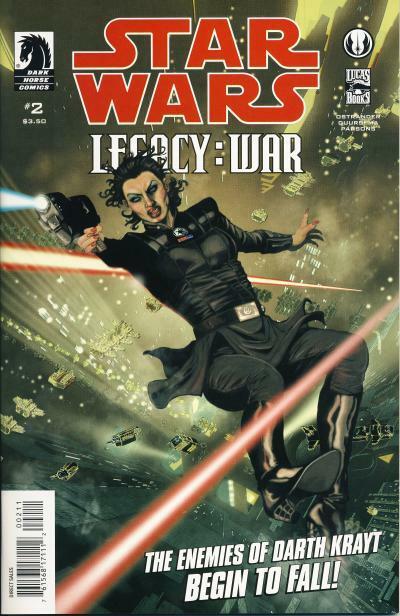 It also built a passionate following and when Dark Horse announced the end of this title in the solicitation for Star Wars: Legacy #50 in April 2010 there were more than a few upset fans. 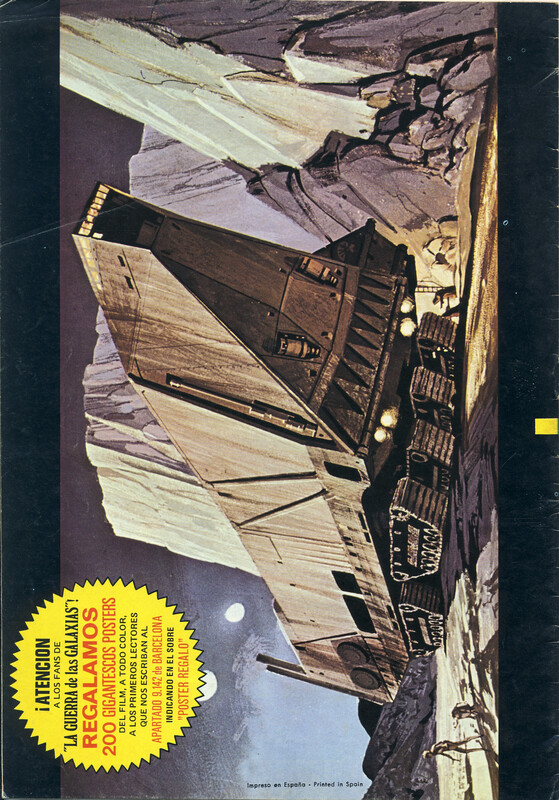 For many, Legacy was the best Star Wars title being published at the time! Fast forward to August 2010 when Legacy #50 was released and more than a few fans must have been shaking their heads. This comic did wrap up a couple of threads including the resolution of the hunt for Vul Isen and the freeing of Princess Marasiah Fel, but it was not a satisfying conclusion by any means. The resurrected Darth Krayt was disease free and more powerful than ever and Cade Skywalker had a vision of a final confrontation with Darth Krayt. Thankfully for fans (how's that for tying this into Thanksgiving?) 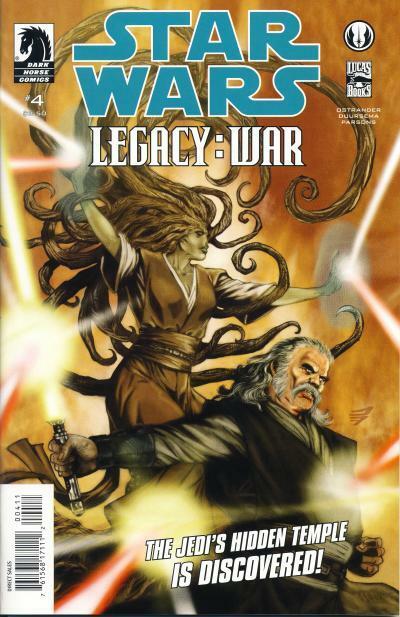 Dark Horse released a 6-part mini-series, Star Wars: Legacy - War, which allowed Ostrander and Duursema to wrap up their tale. Legacy - War does a good job of finishing the story without feeling rushed. It is clear that there was more Ostrander and Duursema could do with the myriad of characters and situations they had created, but as far as endings go, this is a pretty satisfying conclusion. It maintains the same quality of writing and artwork as the ongoing Legacy title which is not always the case for a comic conceived like this one was. 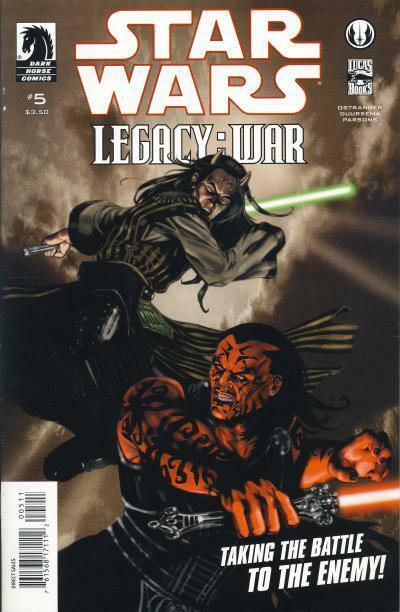 I highly recommend both Legacy and Legacy - War to any devoted Star Wars fan. John Ostrander and Jan Duursema were nexted tapped to build an equally rich Star Wars tapestry with the Star Wars: Dawn of the Jedi series. Unfortunately, that series did not run long enough to live up to its potential. I like to think Dark Horse realized their mistake of ending Legacy prematurely when they launched Legacy II in 2013. 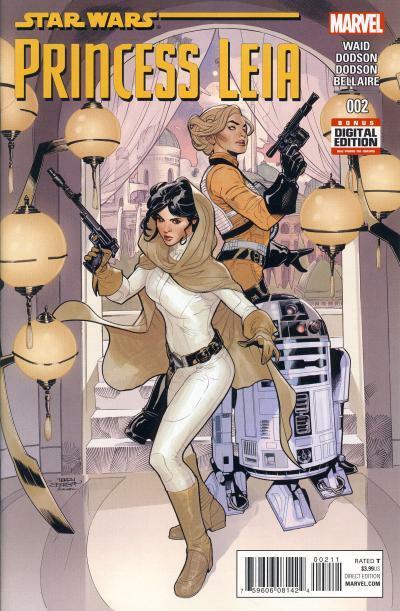 Unfortunately for Dark Horse, Marvel was awarded the license for Star Wars comics less than a year later in January 2014. 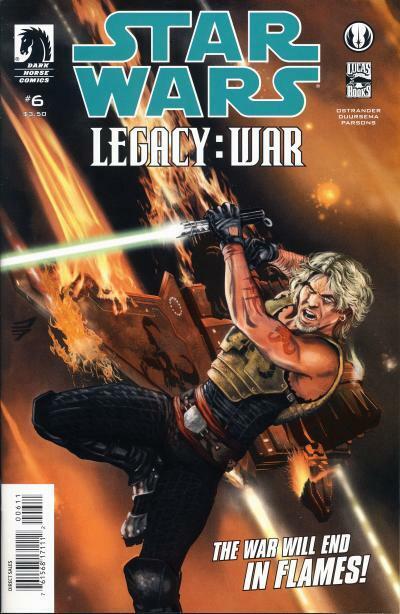 Legacy II ends with with 18th issue in August 2014 and Marvel assumes publishing Star Wars comics in January 2015. The Comics Chronicles released the October 2016 estimated sales last week. Loot Crate's Big Trouble in Little China/Escape from New York #1 from Boom! Studios was the top title and Marvel rebounded from the shellacking DC has been administering the past few months. Not surprisingly, the top selling Star Wars comic was the final issue of Darth Vader and it, along with The Force Awakens, actually saw an increase in the number of units sold. Darth Vader #25 saw a huge increase in unit sales. Some of this is attributed to the large number of variant covers that were released for this final issue. Some of this is also due to the mystery surrounding the fate of Doctor Aphra, 0-0-0, and BT-1 which Marvel has astutely promoted. We now know all 3 characters survive and Doctor Aphra will be receiving her own ongoing series beginning in December. It is hard to imagine Doctor Aphra's fan base eclipsing Darth Vader's even though she has turned out to be a fan favorite character. I believe this will have turned out to be a shrewd move by Marvel, capitalizing on this character's popularity at a time when female characters in general are having considerable success in comics. Let's face it, Darth Vader is served best in small doses, and when he appears, he should be a powerful force to reckon with. He has also had just under 40 years of stories told. Doctor Aphra is a clean slate and one that has been sorely lacking in Marvel's Star Wars line. It is nice to see Marvel branch out beyond the staid movie characters and hopefully this title will prove successful and Marvel will continue to introduce new Star Wars titles not based on movie characters. Unfortunately, the increase in unit sales for Darth Vader did not carry over to the main Star Wars title. Star Wars has now fallen for the 4th straight month, shedding close to 18,000 units during that time. This all happened during the current story arc The Last Flight of the Harbinger which started with issue #21. Is it the story, the interior artist Jorge Molina, fatigue with the main Star Wars characters, or something else entirely? I have no doubt the Yoda issue coming up with get a boost in sales, but will it be enough to recover the sales lost recently? Comparing Poe Dameron to Kanan again shows the unit difference between the titles narrowing. Kanan had only shed a little over 1,000 copies between issue #6 and 7, but Poe Dameron lost just under 2,500 copies. I was predicting this title would be safe, but now I'm not so sure. It is drifting down into Kanan numbers and, unlike Kanan, the character is not getting continual exposure on a television series. The Han Solo mini-series finished and despite the large number of variants for the final issue, the title did dip a little at the end. Even so, this mini-series has shown decent numbers and there is no doubt Marvel is cooking up another mini-series. The Force Awakens saw a slight increase in unit sales. I hope the 6th issue sees the same. Let's hope Marvel releases an adaptation of Rogue One and they do not take 6 months to do so. The average sale per issue bounced significantly thanks to Darth Vader #25 and it would rank 29th on the top 300 chart for the month of October. Star Wars trade paperbacks, reprint titles, and reorders are not accounted for with these numbers. The Star Wars trade paperbacks are strong sellers. Take a look at the Star Wars Sales Estimate Chart and please read the blog posting October 2016 comics sales estimates now online; smaller Loot Crate effect seen. The Comics Chronicles released the September 2016 estimated sales last month. Like August, DC Rebirth titles dominated the top of the charts. Marvel's top title in September is the Civil War II mini-series which took the 4th positio. Marvel's next title to chart is the ongoing Star Wars in the 15th position. This title has proven to be Marvel best selling ongoing title. Both Darth Vader and Han Solo were delayed, so September saw only 3 Star Wars titles ship, the lower number of titles going back to February 2015, the 2nd month of the modern Marvel era. The Star Wars title saw another drop in units sold, although the percentage of the drop is low. Still, this drop added to the over 10,000 units this title fell in the past 2 months is starting to look significant. The trend has definitely been down. Poe Dameron saw a larger drop than Kanan's 6th issue and the difference between the sales in these titles has narrowed by 2,000 units. Poe Dameron #6 sold 50,275 units and Kanan #6 sold 45,402 units for a difference of less than 5,000 units. While this might seem troubling, understand, Poe Dameron in the 49th position on the charts is Marvel's 10th best selling title for the month of September! That is astonishing for many, many reasons, none of which are good for Marvel overall. The Force Awakens #4 shed just under 3,500 units. I understand someone buying the 1st issue of this title and not picking up the rest of the issues, but it is strange to think someone has picked up 2nd and 3rd issue and didn't decide to stick with this mini-series. Regardless, with just over 38,000 units sold, it is still not Marvel's lowest selling non-reprint Star Wars issue which is Kanan #12 with 36,649 units sold in March 2016. The average sale per issue is the lowest for the modern Star Wars line. Even considering that, it would still rank 37th on the top 300 chart for the month of September. Star Wars trade paperbacks and reorders are not accounted for with these numbers. The Star Wars trade paperbacks are strong sellers. Take a look at the Star Wars Sales Estimate Chart and please read the blog posting September 2016 comic sales estimates: DC takes 39 of Top 50 slots. Rogue One is set to open in theaters across the world in less than a month and like The Force Awakens last year, there are some tentative comic book connections to be found. Unlike when The Force Awakens was released, we have not seen any movement on any Star Wars comics due to rumors of links to the Rogue One movie. A word of caution, while I have not seen the movie nor do I have any inside information concerning the movie, much of this can be construed as spoiler material. If you don't want to be spoiled, please do not proceed with reading this. Not so much a rumor as fact, black clad Stormtroopers first appeared in a Russ Manning Star Wars newspaper strip. 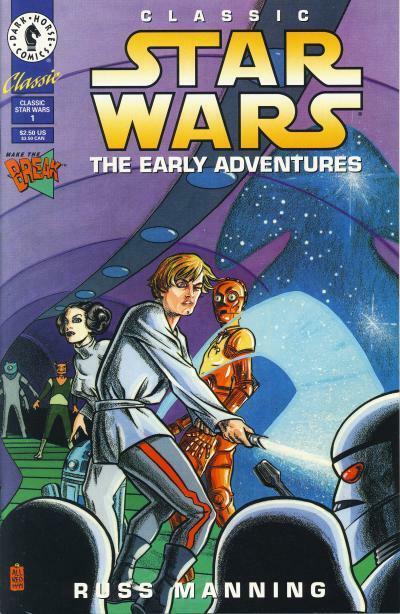 The Russ Manning strips were adapted to comic books by Dark Horse in the Classic Star Wars: The Early Adventures title. 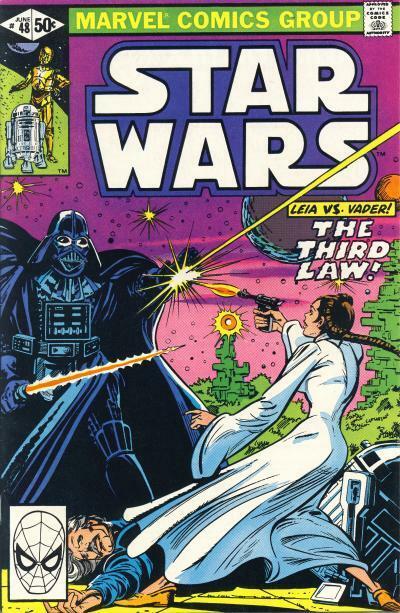 The first issue features the story where Luke Skywalker and Princess Leia face off against the shadowy Agent Blackhole who employs the all-black Imperials known as Black Hole Stormtroopers. Later on, these troopers became known as Shadow Stormtroopers. In Rogue One, the black clad Imperials are Death Troopers under the command of Director Orson Krennic. They differ slightly from Shadow Stormtroopers, mostly in the helmet. The Princess Leia mini-series picks up right after the destruction of the Death Star in A New Hope. In the story, Princess Leia is assisted by a female Alderaan pilot in the Rebel Alliance named Evaan Verlaine. Topps released several digital trading cards which show character from Rogue One and one is an unnamed X-Wing pilot that looks like Evaan. 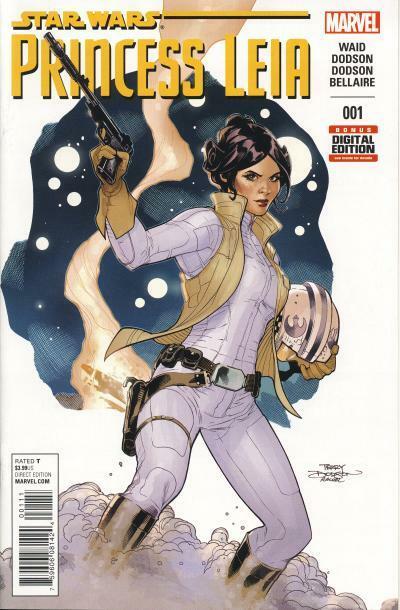 Evaan Verlaine is shown on the cover to Princess Leia #2. There are additional comics with connections to Rogue One. Poe Dameron #8 shows the helmet of a Death and a Shore Trooper in the story. Gigorans, the tall, hairy creatures seen in the trailer, are set to appear in Doctor Aphra #1. Interestingly, the Gigorans are a product of the Expanded Universe. The first official television broadcast in South Africa occurred on January 5, 1976. While the rest of the world was embracing this new visual media in the 1950s and 1960s, Hendrik Verwoerd, the South African Prime Minister from September 2, 1958 until his assassination on September 6, 1966, and Albert Hertzon, the South African Minister of Posts and Telegraphs from August 24, 1958 to February 7, 1968, were firmly opposed to television being brought to South Africa. They felt if South Africa had television, importing foreign programming was inevitable which would make [non-white] Africans unhappy with their position in society. This was during South Africa's period of apartheid and the ruling class was doing everything in their power to maintain the status quo. It is in this environment that radio flourished and the popularity of the South African photo comic was born. The almost 3 decade success of photo comics (comics with photographs instead of art married with word balloons) in South Africa can be traced back to Hint Hyman and Sep Schmidt's earliest photo comic, Kyk or Look, in April 1960. Their publishing company, Republican Press, acquired a German printing press in Durban which allowed them to publish many photo comics, upwards of 20 a month, which they shot using locals. The success of photo comics would allow Republican Press to branch out into other non-comic magazines where they were a major player. 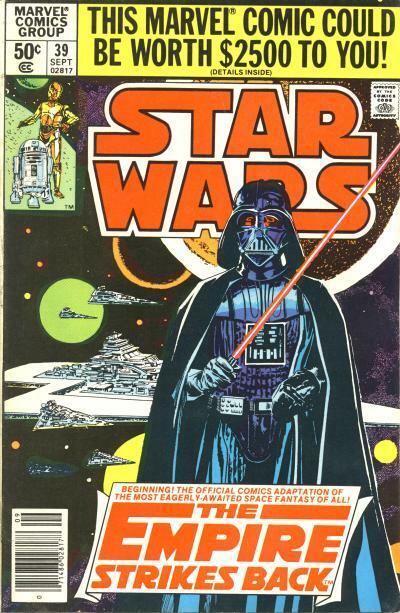 But it is with another of their comic enterprise, Supercomix, where we would get South Africa's first Star Wars comic. From 1976 to 1984, Republican Press printed American comics for South African readers under their Supercomix imprint which was dubbed South Africa's Own Comics. The stories were from publishers DC, Marvel, Charlton, Harvey, and Gold Key. These would include the first Marvel stories published in South Africa. It is only natural during this era where U.S. pop culture was invading South African televisions, movies, and comics, the Star Wars comic adaptation would be published for South African readers. The indicia says the comic is published by Super Comix and printed by Republican Press. It is not clear why this comic uses the two-word "Super Comix" while other Supercomix titles I've seen use the one word "Supercomix" name and familiar logo. This is an early comic in the line, so it is possible they had not yet settled on the exact name and logo they would use for the imprint. 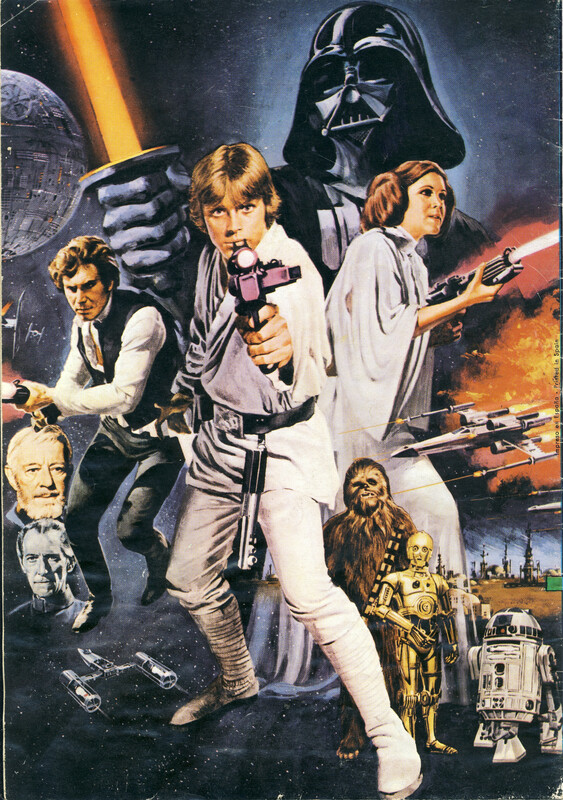 The cover is the same as the U.S. cover for Star Wars #1. The UPC box has been replace with a blurb that reads The Complete Film in One Fabulous 116 Page Comic! and the blurb on the U.S. cover that reads Fabulous First Issue! reads Special Souvenir Issue! on this issue. My understanding is the comic was expensive for the time with it's price of 1,50 rand and subsequently had low sales. I would be remiss if I did not mention my sources for this posting. Along with Wikipedia much of the information came from the article The evolution of African pulp fiction, the incredible blog by George van der Reit South African Comic Books, and George's article Supercomix! A History of Comic Book reprints in South Africa in Foreign Comic Collector Magazine #3. George is doing a terrific job of research and documenting South African comic books and his post Supercomix Star Wars is what first brought my attention to this comic. The cover for O Incrivel Hulk #33 from Brazilian publisher Editora Abril is a combination of art from 3 U.S. cover. The interior story is from the fabulous 2-part story published in Star Wars #51 and 52. 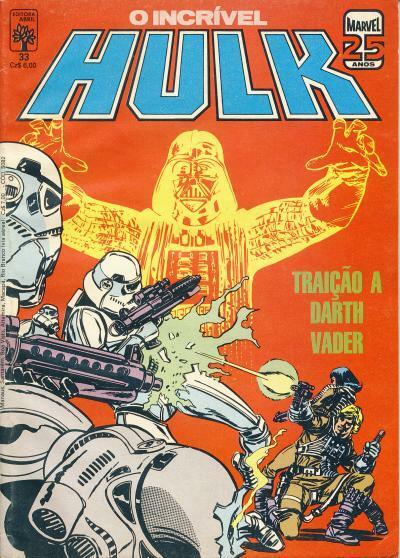 The cover declares Traição a Darth Vader or Betrayal of Darth Vader. 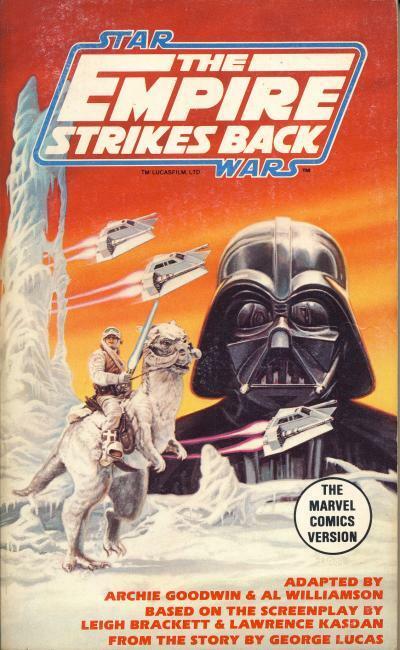 The Darth Vader head is taken from the cover of Star Wars #39, the first part of the 6-part The Empire Strikes Back adaptation. The body and arms for Darth Vader are from the cover of Star Wars #52. Notice from halfway down Darth Vader's chest plate, the art differs. Undoubtedly this was modified to allow the different pieces of art to overlap seemlessly. 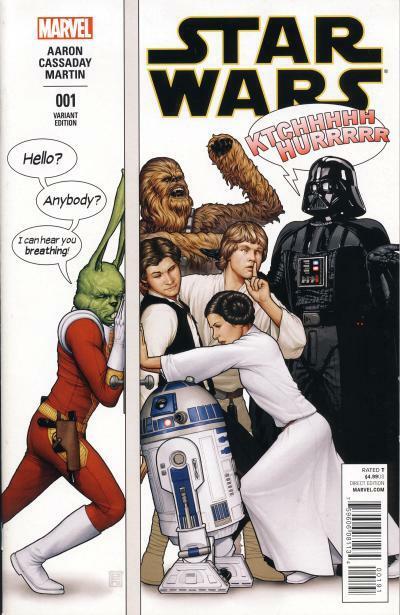 The two Rebels are Luke Skywalker and Shira Brie; they, along with the Stormtroopers, are taken from the cover of Star Wars #57. Shira is not firing her blaster like she is on the original cover. She is also not shown in the story since her first appearance is in Star Wars #56. This is not the only Star Wars cover from O Incrivel Hulk that is a mash up of art from different comics. Granted, borrowing art is cheaper than commissioning new art, but it is not entirely clear why Editora Abril felt this was necessary. 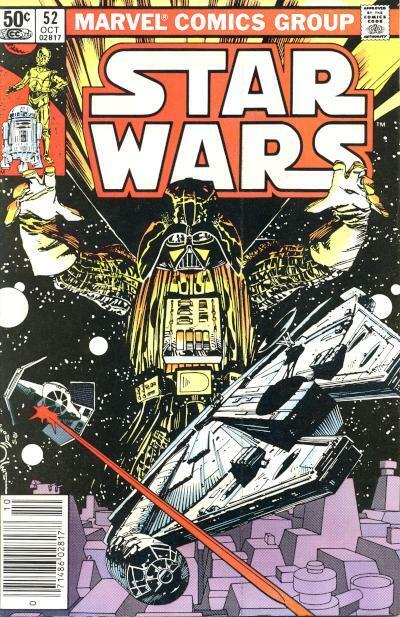 The cover for Star Wars #51 contains plenty of action with Luke battling an AT-ST. And if they felt Vader was necessary for sales, the cover for Star Wars #52 has a terrific cover featuring Darth Vader by Walt Simonson. Regardless, it is these types of modifications that makes foreign comic collecting so interesting. The idea that the Galactic Empire did not have complete control of the galaxy was only cursorily mentioned in the movies. It was understood that as one went further from the "bright center of the universe" towards the Outer Rim Territories that Imperial presence waned, but, as was seen in the original movie, the Empire was able to muster substantial force to occupy planets far removed from the core worlds if necessary. The first Han Solo novel in the Expanded Universe introduced the Corporate Sector Authority which oversaw a large number of star systems autonomous from the Galactic Empire. But even the Corporate Sector Authority was located in the Outer Rim Territories. Marvel went one step further in exploring the reach of the Empire by introducing a planet called Aargau, a major banking center of the galaxy. Aargau is able to operate outside the purview of the Galactic Empire with "the technical superiority of it's armed forces." In a nutshell, Aargau is neutral Switzerland in a Nazi occupied Europe. And like Switzerland, Aargau has it's fair share of political intrigue, as the story in Star Wars #48 shows. 1. The unlawful removal of precious metals. 2. The unlawful possession of weapons by non-citizens. 3. Willfully conspiring to defraud, discredit or deceive the bank of Aargau. Darth Vader: I have obeyed my Emperor's orders. I have walked the razor's edge in the diplomatic snakepit. But the time for subtlety is past! My primary mission is to stop the loan! You know that I can destroy you as easily as I lift my finger! I have no wish to tread on the Emperor's delicate diplomatic toes, but if I am forced to do so, I shall. Vader, clearly agitated with the diplomatic charade, strikes down Tardi with his lightsaber. Leia pulls out a laser pistol and takes a shot at Vader which he easily deflects. It turns out both have smuggled weapons into Aargau in their diplomatic pouches. The rest of the pages are exposition between Leia and Vader. Leia reveals that Tardi is actually a droid replacement for the real Tardi who died months earlier and the loan has already been approved with the crown jewels of Alderaan as collateral. Leia needed Vader to kill the Tardi droid to cover up the evidence as "Tardi" would be scanned for precious metals when leaving the planet. Vader reveals his real object was stealing the crown jewels of Alderaan. Of course, between the two of them, they managed to break all 3 primary laws! 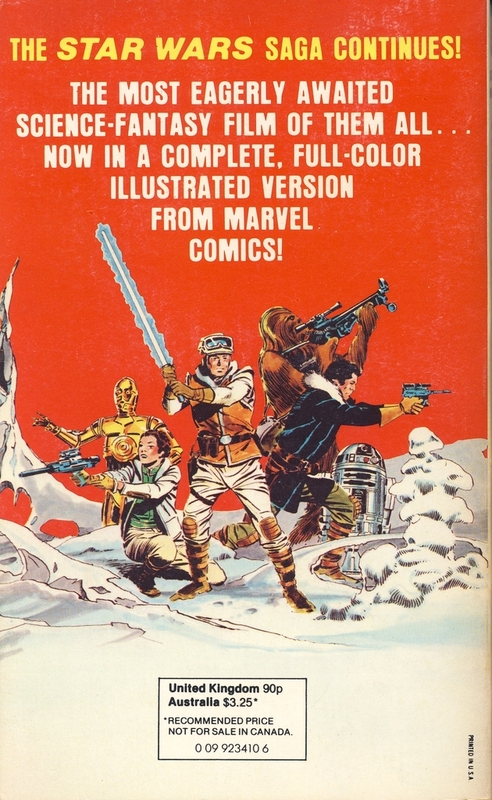 The cover and interior artwork ends Carmine Infantino's run on the Star Wars title. (He did not work on issue #16, 17, 38 or The Empire Strikes Back adaptation in #39-44, but did the artwork on all the others going back to issue #11.) Carmine will return to provide artwork on Star Wars #53, 54 and Annual #2. 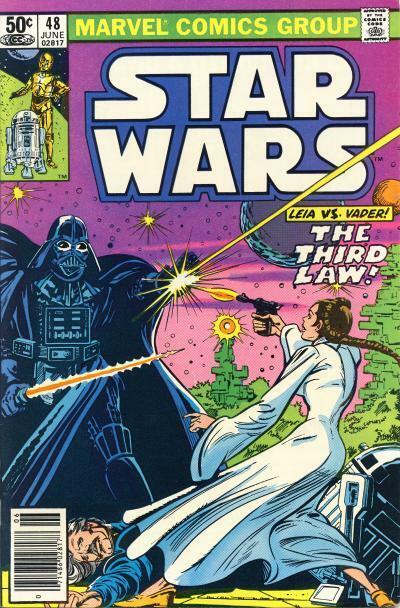 The cover for Star Wars #48 shows Leia shooting at Darth Vader right after he cuts down Viscount Tardi. Admittedly, the story is wonky. Both Princess Leia and Darth Vader act out of character, especially when considering their interplay in the prior movies. Still, it is a nice change of pace for the era and offers an early glimpse into the political intrigue tales that dominate the prequel era. SUPER ΜΠΟΫ is an anthology title that began publication in 1983 and ran for 88 issues. The publisher is Theofanis Pangalos and the format is the same as the title Μπλεκ which printed Star Wars #1 - 6. The title SUPER ΜΠΟΫ translates into English as Super Boy. 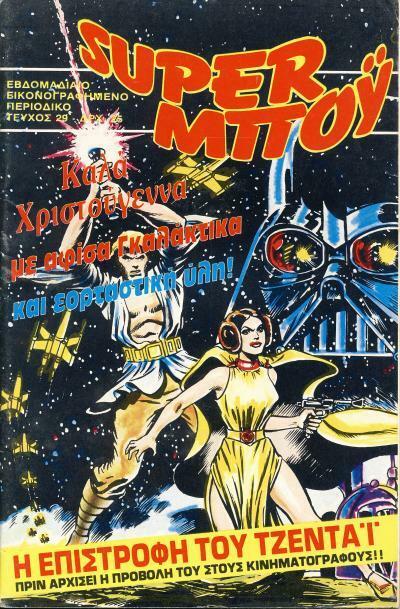 The Return of the Jedi comic adaptation is translated to Greek starting with SUPER ΜΠΟΫ #29. This issue only contains the first 3 pages of Return of the Jedi and also features a Star Wars cover. 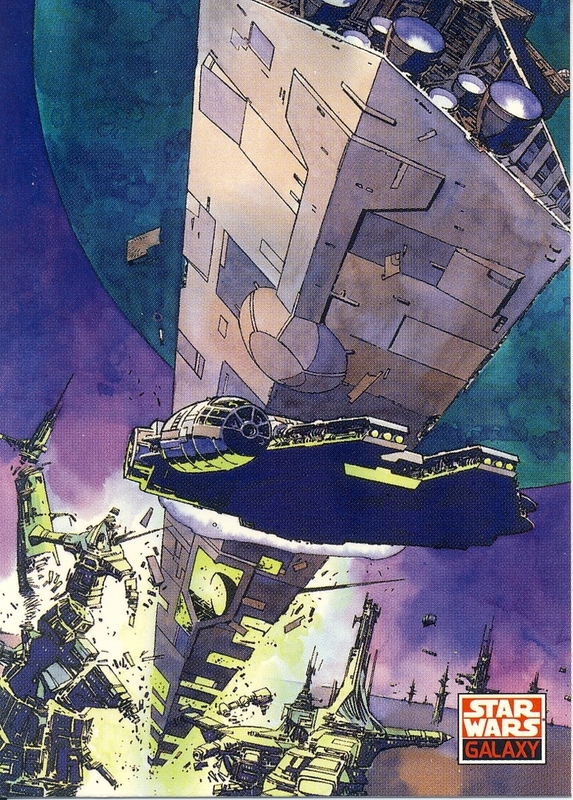 The cover is a cropped image from the Marvel Special Edition Featuring Star Wars #1. Only 3 issues of SUPER ΜΠΟΫ contain Star Wars comic covers: #29, 33, and 41. Interestingly, I'm unaware of a published Greek translation of The Empire Strikes Back adaptation. If anyone knows definitively if that movie was translated for Greek comic readers, please let me know. USA Today is reporting that Marvel will debut a 5-issue mini-series starring Darth Maul in February 2017. It will take place before The Phantom Menace while Darth Maul is Darth Sidious' student. 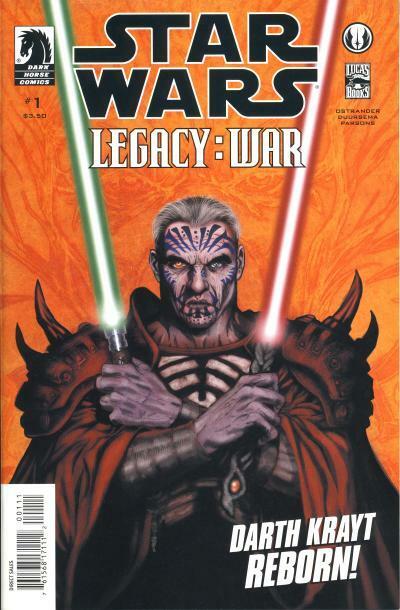 The untested Maul will venture into the underworld to seek out the Jedi Padawan Eldra Kaitis. You can read more over at USA Today in the article Exclusive: Darth Maul gets a new 'Star Wars' comic book. 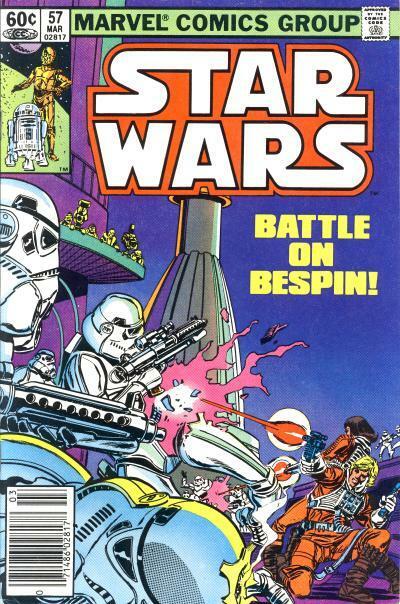 It had been a tradition that the publication of a comic adaptation coincides with the release of a Star Wars movie. Unfortunately, that practice was broken for The Force Awakens when Marvel delayed publication of a comic until 6 months after the theatric debut. The novel was released a couple of weeks after the movie, so it is not clear why the comic came so late, although it is easy enough to speculate why. One possible reason has to do with how late editing occurs in the film making process. This has resulted in a few scenes and dialogue being included in prior adaptations that were cut or altered from the movies. Unlike a book, comics are a visual heavy media, so getting the look of characters, locations, ships, etc. is harder to achieve if the film is still being assembled. Another reason is to avoid spoilers. With the advent of the Internet, anything remotely related to these movies is disseminated rapidly and a comic version would have undoubtedly spoiled the film for more than one movie goer. A final possible reason is financial. It is easy enough to assume that the movie would do well but comics adapted from movies, even blockbusters like The Force Awakens, do not necessarily sell in large numbers. Financially The Force Awakens comic did pretty well for Marvel however. Issue #1 was the 20th best selling comic in June 2016, selling around 80,000 units. There were several incentive variants available to retailers, including my favorite, the Joe Quesada drawn cover offered initially as a 1:100 ratio. Joe Quesada is best known as the editor-in-chief of Marvel during the 2000s although he is also an accomplished writer and artist. He provided artwork for variant covers for several Marvel Star Wars #1 issues, but it is his artwork for The Force Awakens #1 that stands out. In my opinion, this cover more than any other, captures the character of Rey. Rey sitting on the side of a sand dune on Jakku peering at the sky is reminiscent of the scene from the original movie where Luke Skywalker is gazing out past the twin suns on Tatooine. Both scenes highlight the yearning these characters have for leaving their mundane lives. 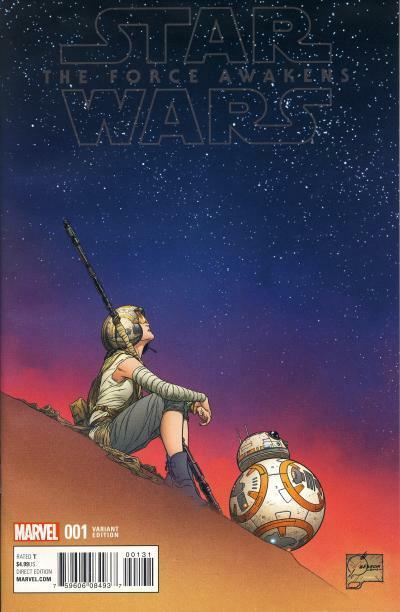 Having the bulk of the cover be the stars and showing BB-8 looking up as well are both nice touches. There is also a black and white version of this cover. Jaxxon first appeared in Star Wars #8, hired by Han Solo to join his group of Starhoppers to protect a village on Aduba-3 from Serji-X Arrogantus and his band of Cloud-Riders. Unfortunately for Jaxxon, his being a 6 foot tall green rabbit that wears a red jumpsuit and is proficient with laser guns hasn't endeared him to everyone. Some see him as a cool character, ala Rocket Raccoon, while others liken him to Jar Jar Binks. More than any other character from the period, Jaxxon represents the silliness that several fans attribute to Marvel's original Star Wars title. Apparently Marvel seems to agree with those who feel Jaxxon is a joke. Offered to retails who hosted a Star Wars #1 launch party in January 2015, a variant cover was produced that pokes fun at the character. Standing on one side of a door is Jaxxon while holding the door shut on him are Luke Skywalker, Princess Leia, Han Solo, Chewbacca, C-3P0, and R2-D2. The artwork is done by John Tyler Christopher who is better known for his artwork on the Star Wars action figure covers. There is a Star Wars #1 party sketch variant as well which was given out 2 per store that hosted the launch party. 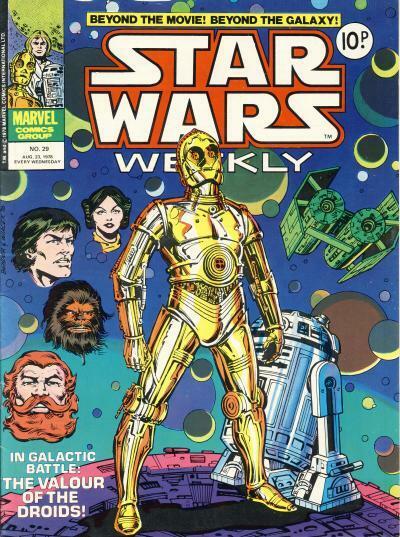 The cover for Star Wars Weekly #29 implies C-3P0 and R2-D2 have a significant part to play in the content. After all, the droids are featured prominently on the cover and a blurb reads In Galactic Battle: The Valour of the Droids! Unfortunately, the droids do not have any more significance in this story than most others; there is a bit of comedy on page 4 when Han Solo uses the slang term "What's the good word ...?" which C-3P0 takes literally and more banter occurs between Chewbacca, C-3PO, and R2-D2 as the Millennium Falcon comes under attack by Jolli, Crimson Jack's second-in-command. But other than those 2 scenes, C-3P0 and R2-D2 are shuffled off into the background while the bulk of the tale centers on the actions of main heroes and Crimson Jack and Jolli. Neither droid does anything valorous. Besides showcasing the droids, the cover also has head shots of Princess Leia, Han Solo, Chewbacca, and Crimson Jack. 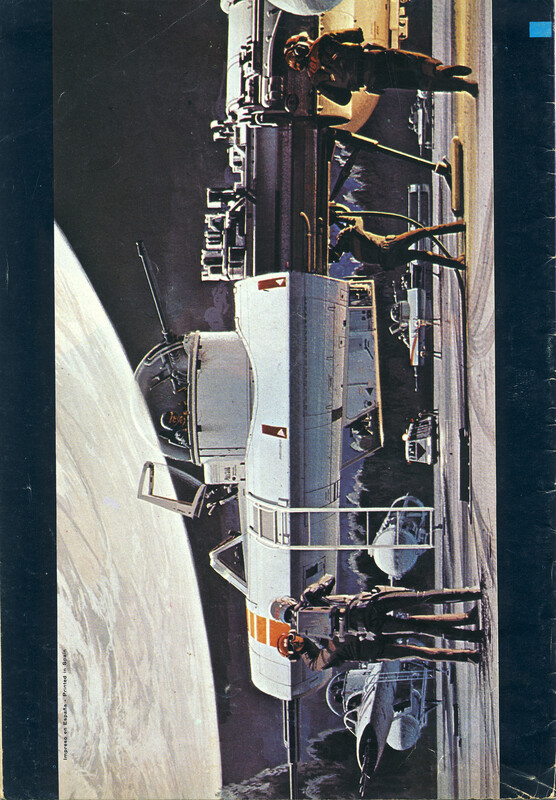 But the most interesting object on the cover is the spaceship to the left of C-3P0. A TIE Bomber! It is only natural that with the standard TIE Fighters and Darth Vader's Advanced TIE Fighter, the Empire would have other special purpose vehicles based on the TIE design. 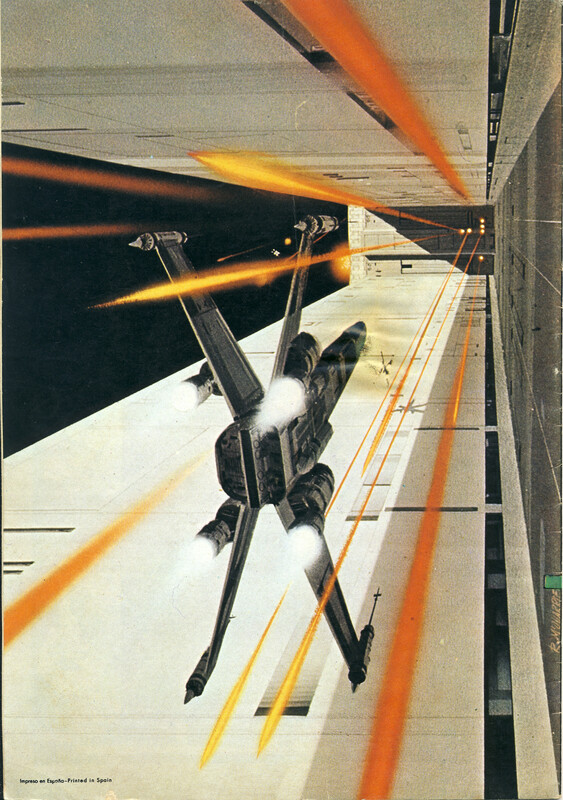 It is hard to believe the TIE Bombers that show up in The Empire Strikes Back were not inspired by this comic or Lucasfilm shared this vehicles design with Marvel. The TIE Bomber is shown in two panels inside and it is uncanny the similarities to the ship in the movies which is why I have a hard time believing this was a coincidence. The ship in the story has the bent wing design like the Advance TIE Fighter and, while the cover does not show it, the left pod has the round pilot window and the right pod does not. Nickel City Con 2016 took place in Buffalo, New York on August 13 and 14. But on July 18th Dave & Adam's Card World and the Creatorbox websites began selling copies of the Star Wars: The Force Awakens #1 Nickel City Con and Creator Universe exclusive. The comic is limited to 3000 copies. The cover is by legendary artist Neal Adams who is famous for his work on DC comic characters Batman, Superman, Green Lantern, and Green Arrow in the late 1960s and 1970s. I believe this is Neal Adams only Star Wars comic work. The artwork features Kylo Ren wielding his unique lightsaber flanked by both The First Order and Galactic Empire Stormtroopers. Kylo is severing the tentacle of an unknown creature. The art is both dynamic and raw and is not based on any scene from the movie. 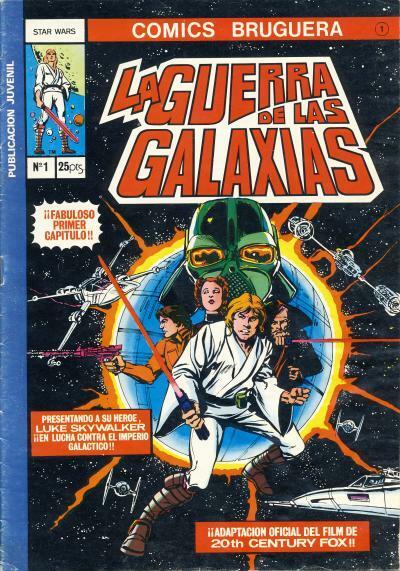 Editorial Bruguera is the first publisher to bring Star Wars comics to Spain. 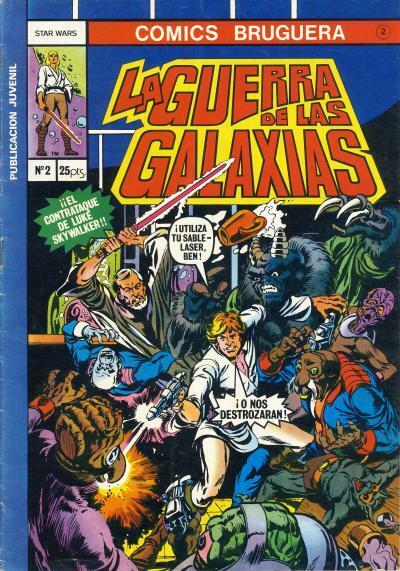 In November 1977 they started a title called Comics Bruguera which ran for 38 issues translating 4 Marvel titles including: Star Wars, The Human Fly, 2001: A Space Odyssey, and Ka-Zar. The first 15 issues of Star Wars are included in this collection as a series within a series with it own numbering in Comics Bruguera #1 - 8, 17, 23, 25, 31, 32, 37 and 38. 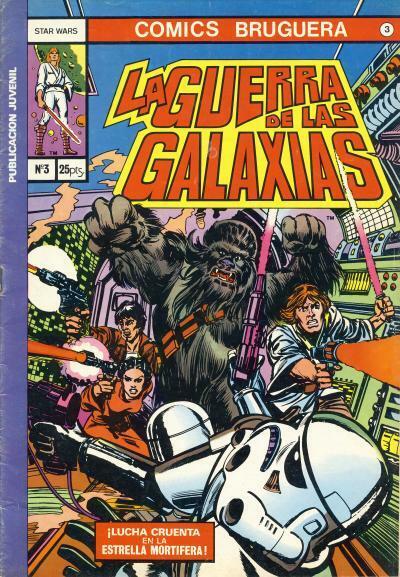 The title used for the series is the Spanish translation of Star Wars, la Guerra de las Galaxias. 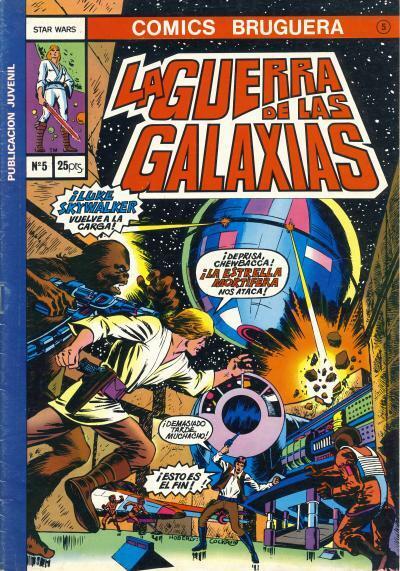 The Bruguera Star Wars comics are distinctively identified by a blue stripe down the left hand side. The cover art is the same as the U.S. editions. 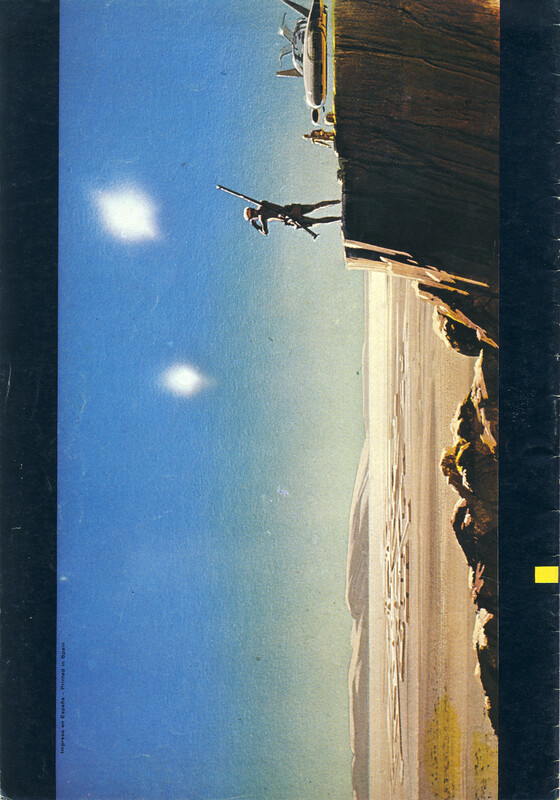 The back cover for Comics Bruguera #1 contains the art from the Star Wars style C one-sheet poster and the other back covers contains a Ralph McQuarrie pre-production painting. 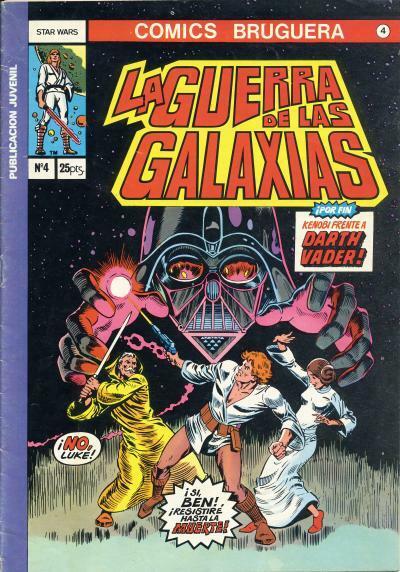 Editorial Bruguera would publish Star Wars comics until 1980 when Ediciones Vértice would acquire the rights. 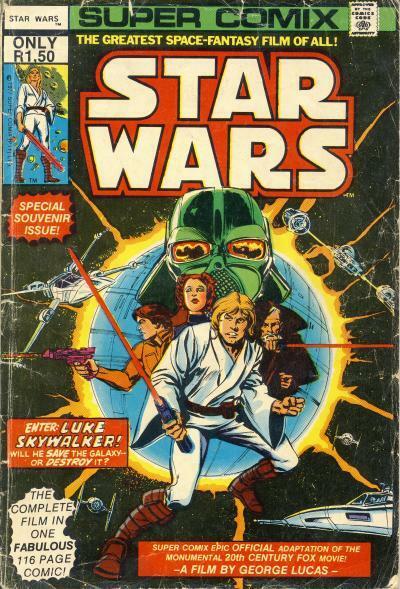 In addition to publishing 15 issues in Comics Bruguera, they published 5 collections including the Star Wars movie adaptation published in 2 treasury-sized issues in 1977 and 1978 using the covers from the Marvel Special Edition Featuring Star Wars #1 and 2, 2 magazine-sized issues compiling Star Wars #18 - 23 in 1979, and a slightly larger than standard-sized movie adaptation of The Empire Strikes Back in 1980. 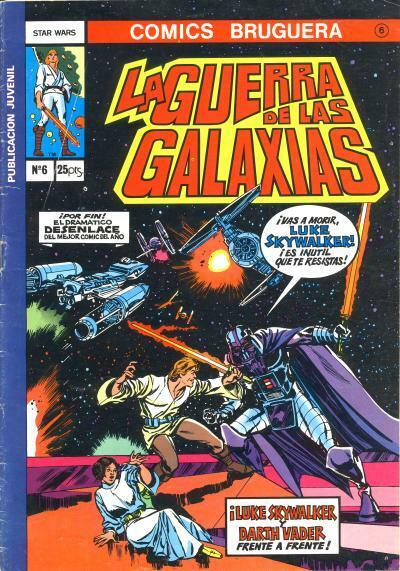 The two issue compilation of Star Wars #18 - 23 is titled El Imperio Contraataca or The Empire Strikes Back part 1 and part 2. 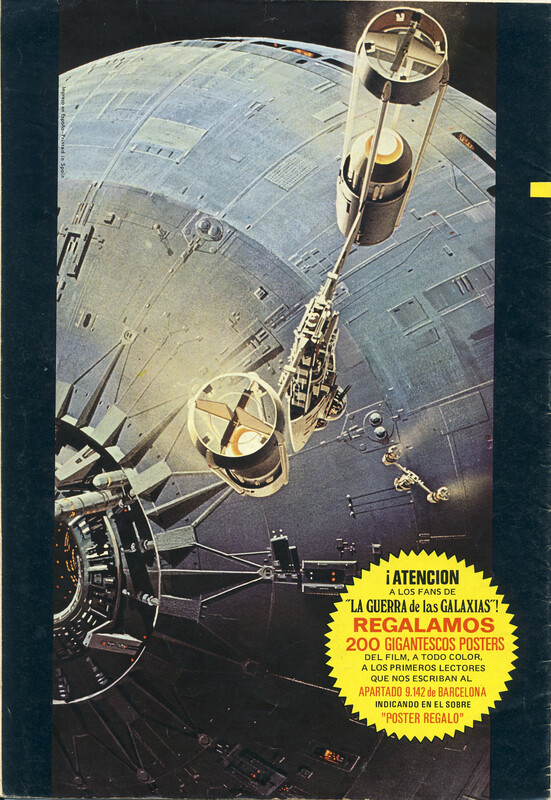 This was not done by accident, as Editorial Bruguera capitalized on the title for Star Wars #18, The Empire Strikes, hoping readers would pick up these issues expecting an adaptation of the movie that was not even released yet! Like most Western European Star Wars comics, these issues are not particularly hard to find although finding them in high grade can be a challenge.